The sitter [1773-1833], Roanoke, Virginia; presented to William Leigh, Halifax, Virginia; his son, J.R. Leigh, Halifax, Virginia; his son, Judge William Leigh, Danville, Virginia; his son, John Randolph Leigh [1895-1961], Danville, Virginia, by 1928; consigned by January 1937 to (M. Knoedler & Co., New York); sold 21 January 1937 to The A.W. Mellon Educational and Charitable Trust, Pittsburgh; gift 1940 to NGA. William Leigh was one of the executors of John Randolph's will. Provenance information conveyed by John Randolph Leigh, 1927 and 1928, is recorded in the Frick Art Reference Library, New York. According to a letter of 6 June 1992 from Melissa De Meideros, Librarian at M. Knoedler (in NGA curatorial files), the painting was consigned by John Randolph Leigh sometime between December 1936 and January 1937. The exact date is not recorded. Makers of History in Washington 1800-1950 [An Exhibition Celebrating the Sesquicentennial of the Establishment of the Federal Government in Washington], National Gallery of Art, Washington, D.C., 1950, no. 16, repro. The support is a medium-weight, plain-weave fabric. The painting has been lined, but cusping is present along all four cut edges. The off-white ground is smooth and thick. Subsequent brushwork was rapid and thick, except in the shadows of the flesh and hair, where the application was thinner. Small inpainted losses are scattered across the entire surface, especially in a network of dots on the facial area and a broader patch on the sitter's right sleeve. The varnish has discolored. Bruce, William Cabell. 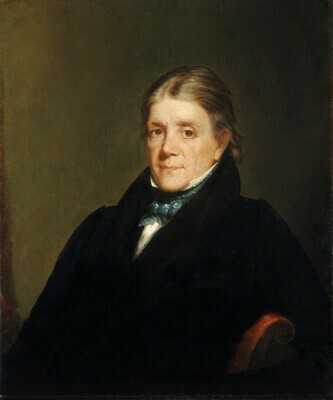 John Randolph of Roanoke, 1773-1833. 2 vols. New York and London, 1922. Reprint. New York, 1970: 2:68. Harding, Chester. A Sketch of Chester Harding, Artist, Drawn by His Own Hand. Edited by Margaret E. White. New ed. Boston, 1929: 150. Preliminary Catalogue of Paintings and Sculpture. National Gallery of Art, Washington, 1941: 96, no. 493. Book of Illustrations. National Gallery of Art, Washington, 1942: 249, repro. 7. Richardson, Edgar P. American Romantic Painting. New York, 1944: 34, no. 57, repro. Paintings and Sculpture from the Mellon Collection. National Gallery of Art, Washington, 1949 (reprinted 1953 and 1958): 145, repro. American Paintings and Sculpture: An Illustrated Catalogue. National Gallery of Art, Washington, 1970: 64, repro. American Paintings: An Illustrated Catalogue. National Gallery of Art, Washington, 1980: 169, repro. Lipton, Leah. A Truthful Likeness: Chester Harding and His Portraits. Exh. cat. National Portrait Gallery, Washington, D.C.; J. B. Speed Art Museum, Louisville. Washington, D.C., 1985: 86, repro. 177. American Paintings: An Illustrated Catalogue. National Gallery of Art, Washington, 1992: 193, repro. Kelly, Franklin, with Nicolai Cikovsky, Jr., Deborah Chotner, and John Davis. American Paintings of the Nineteenth Century, Part I. The Collections of the National Gallery of Art Systematic Catalogue. Washington, D.C., 1996: 251-253, repro.